I was actually pretty excited to make my own laundry soap. Especially when I found a recipe to make the dry powdered stuff. Laundry soap goop looks fun and all, but I was going for speed & ease of preparation. I prefer the poweder and it has become harder to find the scent-free stuff without paying a fortune. My local grocery store had somehow stopped making their name-brand. Mix well in a container, like a large empty coffe can. The amount suggested per load was 2 tablespoons. My brain kicked in. Two tablespoons was not much, even for concentrated laundry powder and I have never been one to put in the full amount. I checked both boxes of borax and washing soap and they recommended from 1/3 to 1/2 cup of each per load, just to boost your regular laundry soap. I decided to err on the side of caution and put in one rather heaping half-cup scoop of my new powdered laundry soap. It worked! Mostly. My clothes were indeed clean, and better yet, scent-free. Static free too, but that could have been from the splash of vinegar I sometimes put in (about a cup). From a random sampling of an unsorted load, regular clothing was fine, dishclothes were actually great, but socks and undies I was unsure of. A big “eh” there. I have read about other alternative laundry washing things and they talk about soap residue in your clothes and machine. I never use the required amounts anyway, and I’ve even run my machine with no soap in a load before (accidentally, duh) so I know how a load looks with no soap. I am not a laundry goddess. I want to be able to toss everything in, all at the same temps, and have it come out reasonably okay. I use scent-free products as I have allergy and asthma issues with them. I don’t use dryer sheets or fabric softener. No fuss, no muss, wash-n-wear fabrics only. So you see I like to keep it simple. Now, I was all over this like a hippie in a hayfield until I got down to calculating the cost. The ingredients are cheap, as I can get bars of laundry soap two-for-a-dollah at the local Dollarama. It’s a bit of work to grate the soap on the backend of a regular cheese grater and it creates quite a bit of lung-hurting dust if you’re sensitive to that. But I was *willing* for the greater good. 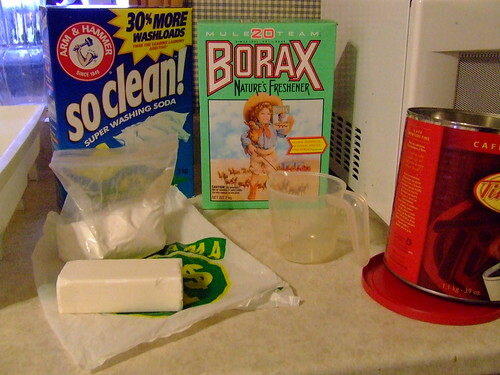 The washing soda is over $5 a box here and the borax a bit over $4. I can get quite a few loads from that, but it still worked out to around 25 cents a load – less if you use less. Maybe 20 cents. Sure, if you use the recipe’s amount of TWO TABLESPOONS it will be cheaper, but it won’t clean all your clothes. At least not to my satisfaction. I compared this to two different kinds of laundry detergent. One a super-sized bulk box of name-brand powdered detergent, and the other a store brand concentrated liquid. The bulk box was slightly cheaper and the liquid around the same. This even accounts for more or less how many loads the manufacturer figured you’d get from their container. Sometimes I get less, sometimes more. Bottom line is I’ll only do this again for times when I run out or when I have to pay substantionally more than $6 for 32 loads. It would also be worth it if your family had scent allergies and you had a hard time buying or finding those products. It would also be good if you needed a travel-sized batch. Sarah and I did the grocery run this morning, but by the time we finally got there it was just about lunch time. Normally this doesn’t even register on our rader very much, but today it did after we kept seeing kids and teens around. Then I realized the high school was just down the street and the grocery store has a deli that serves lunch. Doh. We were both amused by the girls who all dressed alike (to express their individuality) and the majority of boys in a sort of uniform: black tshirt, baggy jeans, skateboard sneakers. I was convinced that the same 6 guys were walking back and forth. Ron is on vacation! I can’t believe it. 🙂 It’s been since Christams that we didn’t have soem sort of plans for the weekend, mostly involving long drives and working on the house. The girls and I took of not very early on Saturday morning to check out the Woodstock market and stop by a few yard sales. The makret was just… okay. It was pretty deserted as far as I was concerned. I asked one lady and she said that was normal. And they were out of farm eggs. I did score a lead on some homegrown chickens though. I also stopped at another veggie stand becasue the horses caught my eye. A lovely family of Mennonites were selling their wears. The girls didn’t get out of the car, as I imagine there would have been a lot of mutal staring going on. I was served by the older daughter while a small boy in somber suit jacket and hat stared at me. I smiled and said hello. I cooked their carrots for supper and they were yummy. Sarah and I were the ones who scored at most of the yard sales. Meaghan sat in the car and wrote. 🙂 Emma only got out at half of them and thankfully she didn’t find a load of junk. Like I said in the last entry, this week we found it in the dollar bin and snatched it right up. It took a lot of thought as to how to present this… shirt… in a manner that would show off just how wrong it is. I mean, everything about it is wrong. I waffled on even showing a picture of how horrific it is. Should it go behind a cut so you can choose whether or not to click? Should there at least be a warning? At any rate, I just decided to go ahead and unleash the Pandora’s trunk of bad taste and questionable fashion sense. Our anonymous model shows off, for starters, the sheer magnitude of the lack of sizing. Is it meant to hang like that? Reminiscent of the Flashdance cropped sweatshirt and sweaty welder-turned-dancer, it actually fails miserably making the viewer wish a welding torch would appear to relieve our eyes. Not seen in the picture above, the drape is such that it actually pulls up a bit, leaving a huge gap at your back. Presumably to show off one’s tramp stamp. (That would be a lower back tattoo.) 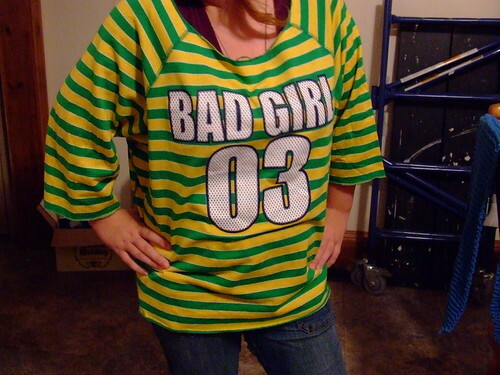 This is highlighted as well by the self-proclaimed title of “Bad Girl“. And we haven’t even talked about the color yet. When was the last time you wore green and yellow together, on purpose, and were not at a sporting event? It’s a case of too many twirls at the center of the roller rink, with the kid who’s trying just too hard to be cool. What a feeling, indeed. The nasty seam finishing (such as it is) the haphazard cropping, the polyester of the fabric (Oh, I forgot to mention that until now), the colors, the lack of fit, yet the mysterious ability to make any wearer (however thin) look as if they’ve gained twenty pounds across their midsection all serve to render the viewer wishing they’d never heard of the eighties in the first place, let alone long for a style comeback. And I’m thinking this may be a garment not manufactured recently, for the retro crowd, but one that was actually present in the eighties. Now, I don’t know about you, but my memory of fashions back then were surrounded by glitter and pastels. Leg warmers, roller skates with rainbow laces and satin baseball jackets, dolphin shorts and glitter transfer tees. Those were the DAYS, my friends.